Bonnie Morris started working with horses at the age of 9. Training was all she thought about. She got her first colt when she was 10. Ground drove him from the start, taught him many tricks, such as shaking hands, sitting, bowing, and a number of other antics. As she got older she pursued her dreams and by the age of 22 purchased land in Auburn, Washington and began the long process of building her own training center. 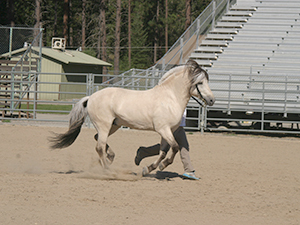 In the mean time she studied dressage and trained her Polish Arabian stallion Geronimos Legacy. She has shown at many shows and is currently working towards USDF Instructor certificate. While dressage is her passion she also competes at American Driving Society 3 day carriage driving events. Showing in dressing, cones, and marathon. 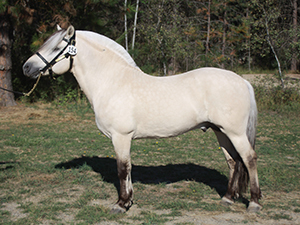 Working with all breeds, she now has a White Norwegian fjord stallion name Ironwood Lordalen. She has a large number of students and is passionate about teaching them lifetime skills for achieving success in the horse world. Her emphasis is always on the well being of the horse and the riders job to learn how to communicate without compromising the physical movement and spiritual well being of the horse. She has trained many different breeds from the big drafts to the little minis and everything in between. She has a great love for all the breeds and it shows in her training. As the years roll on, she has developed some wonderful programs. Summer camps where she teaches more than just horsemanship, evolving into a whole lifestyle of farm and animal care. Birthday parties are filled with a special day of surprise and fun! Ongoing lesson packages for the competitive student as well as internship program with mostly students from Europe. Her main goal for the stable is to inspire imagination and build dreams.